I discovered Lucy Kemp-Welch at the Russell-Cotes Museum, here in Bournemouth. Yet again, I knew her artwork but was woefully ignorant of the painter herself. 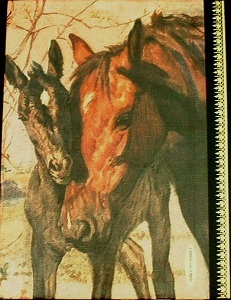 An accomplished painter, who specialised in horses, Kemp-Welch was born in Bournemouth in June 1869. Her prowess in art was obvious from an early age. When she was 19, she moved to Bushey, Hertfordshire, to study at the art school of Hubert von Herkomer. Of German descent, Herkomer’s family left Bavaria for America when he was 2, returning to Europe and settling in Britain when he was about 8. Adept in oil and watercolour, he was also successful in enamel and etching, and was greatly influential in art education through his school, which he’d founded in 1883, and directed without payment. Although she would live most of her life in Bushey, Kemp-Welch’s childhood years in Bournemouth, with the New Forest close by, proved to be a rich source of material for her. She was a great believer in painting out-of-doors, making quick sketches, which she would then attend to in greater detail in her studio. Despite still being a student, she was able to set up her own studio as she was one of Herkomer’s best students. When Herkomer retired in 1904, Kemp-Welch took over running the school until it was voluntarily wound up in 1926. 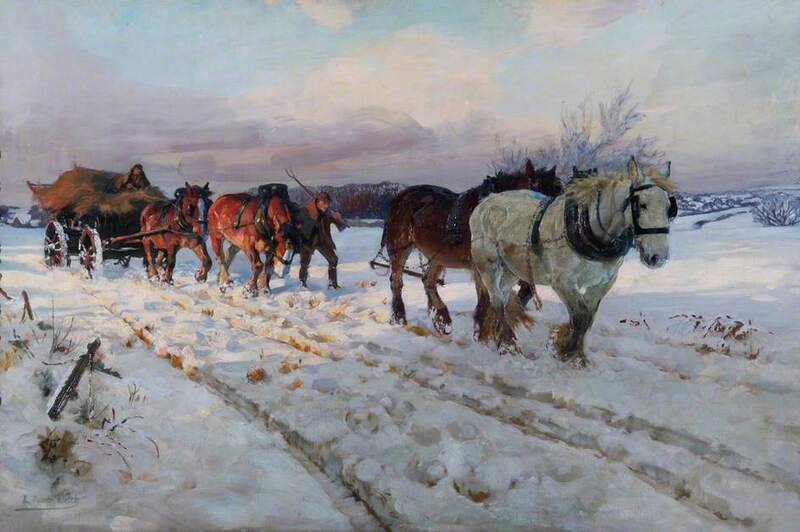 Her first exhibit at a Royal Academy Summer Exhibition, ‘Gypsy Horse Drovers’, in 1895, was painted while she was still in the preliminary class at Herkomer’s school. Kemp-Welch found herself the centre of attention, pursued by picture buyers and journalists, claiming to be so amazed that such a petite, young woman could paint subjects of such size and strength. This must have been an exciting time for the young painter, but, no doubt, difficult also. She was aware that she needed to consolidate her triumph but was still young enough that she was uncertain of the direction her art should take. Added to this was the pressure she felt to produce at least one significant painting every spring for the Royal Academy. Despite producing endless sketches and observations, she didn’t feel they were good enough to convert into paintings for the Royal Academy. 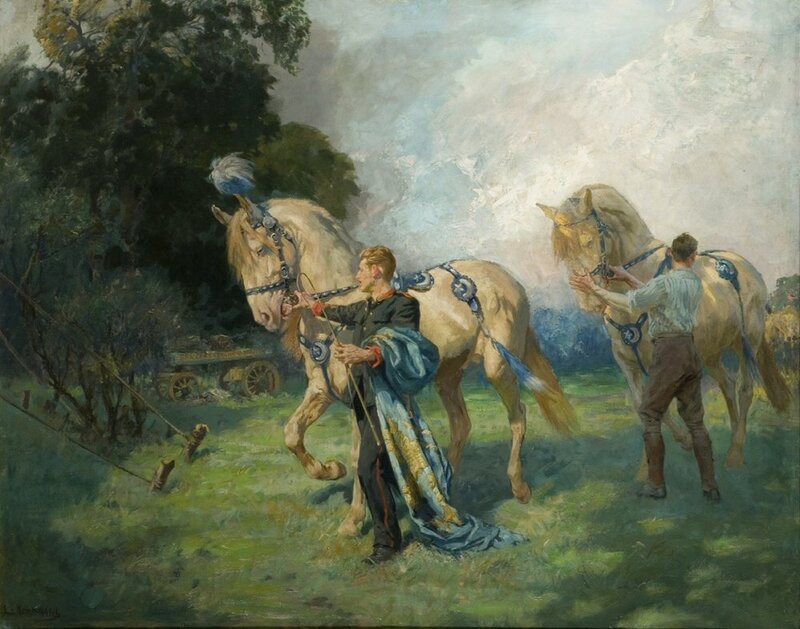 With the outbreak of the Boer War, Kemp-Welch turned her attention to horses in war with the painting, ‘In Sight: Lord Dundonald’s Dash on Ladysmith’, which showed the part played by Lt-Gen Douglas Cochrane, the 12th Earl of Dundonald, in the relief of Ladysmith in 1900. In December 1914, the British Parliamentary Recruiting Committee engaged her to paint an army recruitment poster, which would become one of their most famous posters – ‘Forward! Forward to Victory Enlist Now’. During the First World War, Kemp-Welch exhibited ‘The Leaders of a Heavy Gun Team’, and ‘Big Guns to the Front’. She painted ‘Big Guns …’ on Salisbury Plain while 8 batteries of horse artillery were continually ridden towards her. During the war, women were employed at Army Remount Depots, which trained and prepared horses for military service. The largest depot, at Russley Park in Wiltshire, was staffed entirely by women. The Women’s Work Section of the Imperial War Museum commissioned Kemp-Welch to paint a scene at the Russley Park depot. Dissatisfied with the one she submitted, they requested she sell them a second, much larger one she’d done, which she’d intended to sell to a private client. 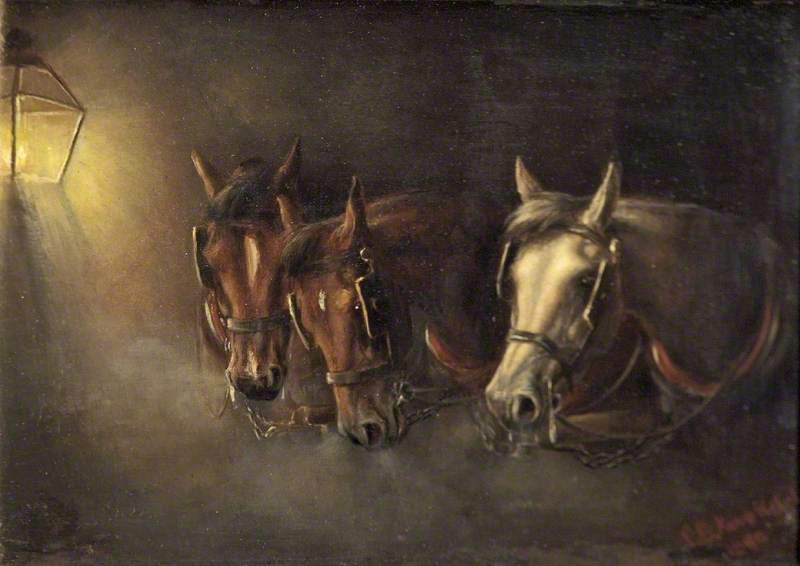 Agreeing that the second one, ‘The Straw-Ride, Russley Park, Remount Depot Wiltshire’, was the better of the two, she sold it to the museum to fulfil her commission. Not much is known of Kemp-Welch’s private life. She did become a good friend of Robert Baden-Powell, and helped him with a horse that had been presented to him by the people of Australia. The horse, Black Prince, was intended for ceremonial parades. Unfortunately, unlike Baden-Powell, Black Prince detested soldiers, and was terrified by the sound of gunfire and drums. Following several ‘incidents’ on the parade ground, the horse’s future was in doubt until Kemp-Welch stepped in. Able to calm the 17.5hh stallion, she looked after him until his death in 1922. Kemp-Welch immortalised Black Prince in the illustrations she did for Anna Sewell’s ‘Black Beauty’, even though Beauty was a mare. After the art school was wound up in 1926, Kemp-Welch spent several of her summers following Sanger’s Circus, recording the horses. She also focussed on scenes of gypsy and circus life, wild Exmoor ponies, heavy horses and farm horses. Lucy Kemp-Welch died in November 1958.